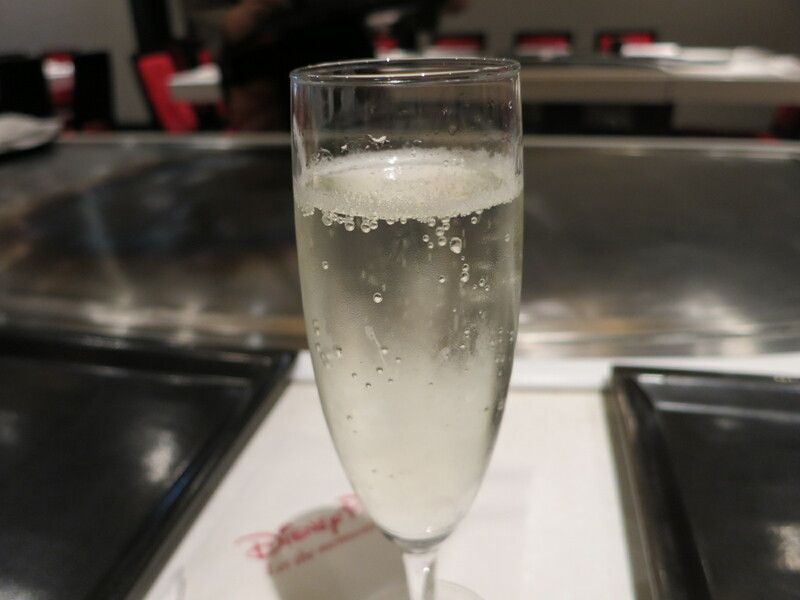 Teppan Edo is a Japanese teppanyaki style restaurant located in Disney’s Epcot park. 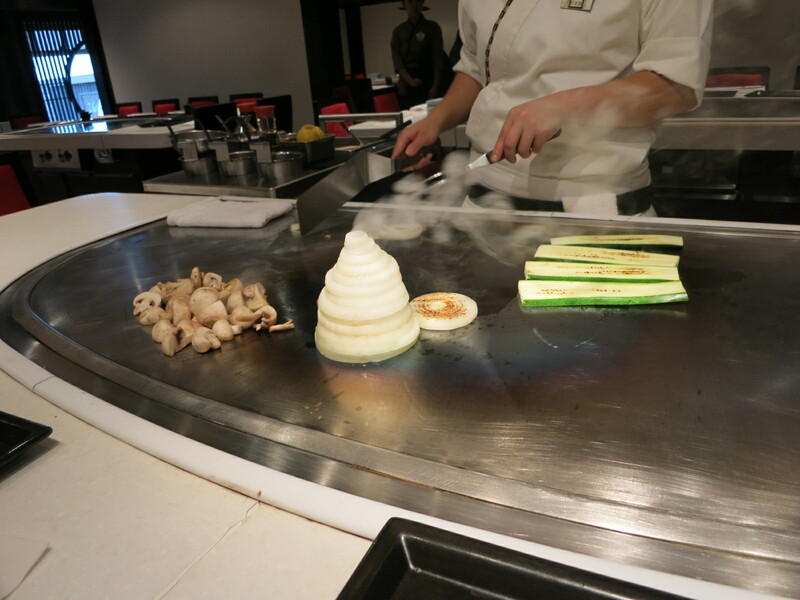 Teppanyaki restaurants cook your food on an iron plate right in front of you. The way it works is that you choose your protein and they fry it up for you with vegetables and noodles. The restaurant is pretty large and you sit at communal style tables around the iron grill. Eight people can fit around each table, so if you have a small party, you will likely also be sitting with other people. It was my first time trying sparkling sake. It was very bubbly and light. It tasted similar to champagne, but definitely more mild and not as bitter. Our chef was very talented and nice and she performed lots of tricks on the grill. She made an onion volcano, but added a Disney twist to it by making it look like Mickey Mouse. When the onions were done cooking, she said “bye Mickey!” and then brutally chopped up the onions, which I found amusing. I chose the chicken and shrimp meal. Both the chicken and the shrimp were cooked just right and they were tender on the inside, but had that nice smokey flavour on the outside. It also comes with udon noodles, onions, zucchini, and mushrooms. I never understand how stuff cooked on these irons grills tastes so good, but it does. With the meat and everything else, this is actually a really filling meal. You get three different dipping sauces with your food. On the left is the “yum yum sauce”, which is a creamy mayo type dip. 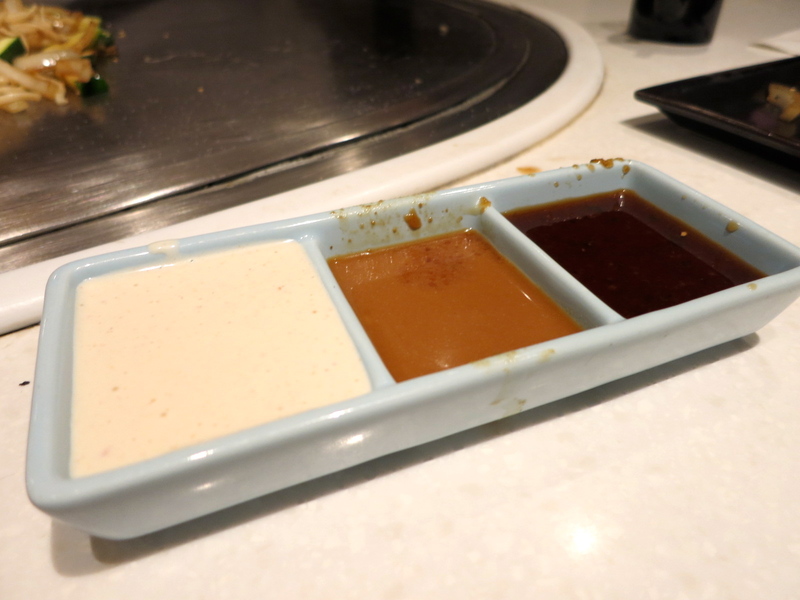 The middle sauce was a mustard sauce, and the last one is a soy ginger sauce. I enjoyed all of these sauces, and I honestly couldn’t decide which one I liked most. The meal also comes with a little bowl of sukiyaki beef rice. 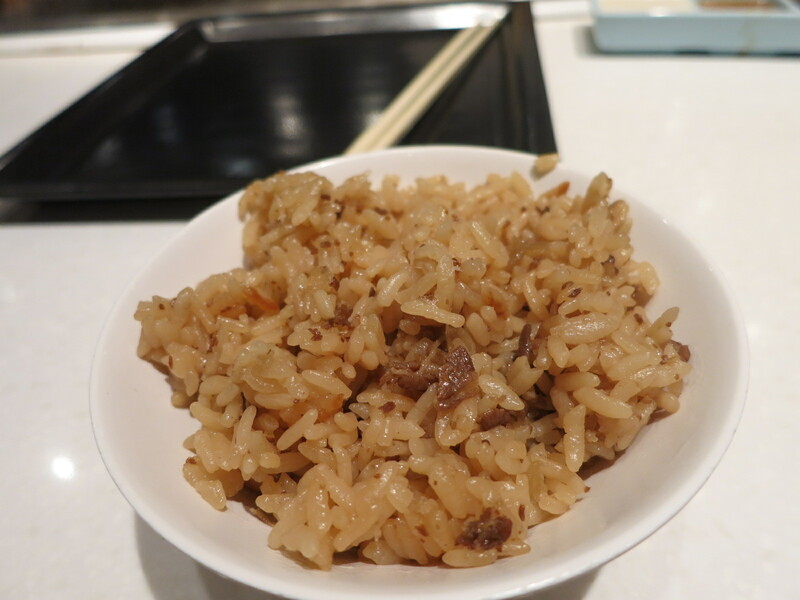 This rice was moist and had a nice beef flavour to it. It was much tastier than just regular steamed rice. I really enjoyed my meal here. The food was tasty and the whole experience and ambiance was fun. Our chef was great and it is something different than most of the other restaurants in the park. Yes, for a fun and delicious meal.